Home parenting How satisfied are pupils, parents and teachers about SEND in schools? How satisfied are pupils, parents and teachers about SEND in schools? At the end of last week, a couple of surveys were published by the Department for Education. One was a survey of pupils and their respective parents/carers at state schools enticingly entitled, Omnibus survey of pupils and their parents/carers Research report Wave 1 January 2017. The pupils were state schools in years 7 to 13. It did not say (that I could find) whether any of the children were in special schools, although there were significant sections on children with SEND. The second was the Teacher omnibus survey and a Senior Leader Booster Survey, also from 2016. This also includes some interesting information about children with SEND, so I’ve waded through the data over the weekend and dug out some interesting statistics and made them into pretty pictures for you. What I have selected are very much “snapshots” from each report and some certainly do indicate a closer look. First we’ll look at the parent/carer report. 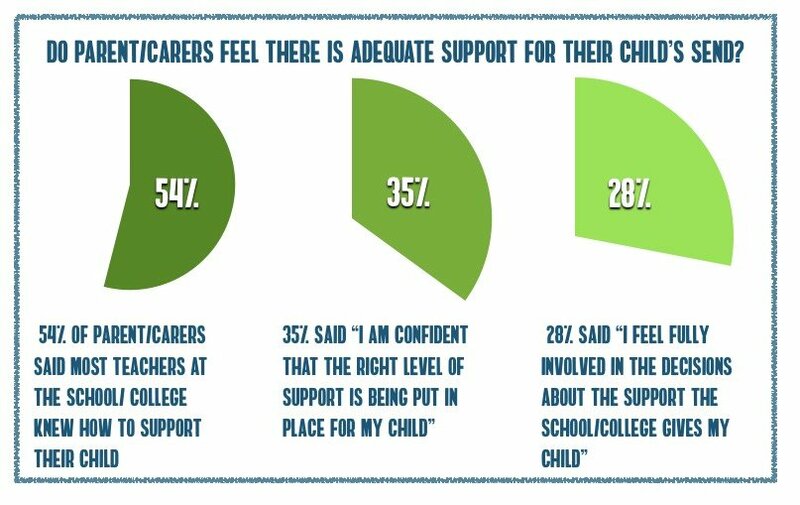 Do parent/carers feel there is adequate support and do pupils feel that teachers are able to help them prepare for their future? and parents /carers, children and young people need to be actively involved in decision-making from the start, for example, in the initial decision about whether a child or young person has SEN.
With this in mind, they put a number of statements to parents /carers of children with SEND about the support provided for their child and asked which they felt applied to them. But, as I think they hint, there are other questions of far greater concern such as: Is this just a lack of communication or are there very real failures of the SEND reforms at a classroom level? I believe this is much closer to the truth and I’m not blaming classroom teachers. How can they practice what they have not been shown or informed about? Now, you would have a good point if you said that there was enough information out there for teachers to educate themselves on the SEND reforms. However, we also know how much pressure the current system of testing and reporting and large classes puts on teachers, who are only like you and me: human. School leaders and their LAs or Academy management teams or whoever is in charge should be preparing, or providing from third parties (Nasen and CDC have lots of good material and we have our own flow charts), easy-concept information and training. If you are a parent who, had you been asked, would have answered the same way, please tell us in the comments below (not on Facebook comments as they will get lost) why this might be so. One of the reasons is clear from the fact that only 28% feel involved in decisions made to support their child. The SEND reforms were supposed to put the family at the centre of the decision-making process, but if this information has got through, it seems to have largely been shunted under the rug. In some respects, from a teacher’s point of view, I can understand that involving parents is time-consuming, sometimes thankless and they may even be hard to get hold of or impossible to get into school, for all sorts of reasons. But in other respects, it’s the law, so you have to have a record of at least trying your best in various ways. It is in the interest of every school to ask their parents of children with SEND if they feel involved, how they would like to be involved (again, you may need a variety of ways) and set up a system that can be easily implemented and managed by a class teacher. The TES website, Nasen et al must have lots of help for this. 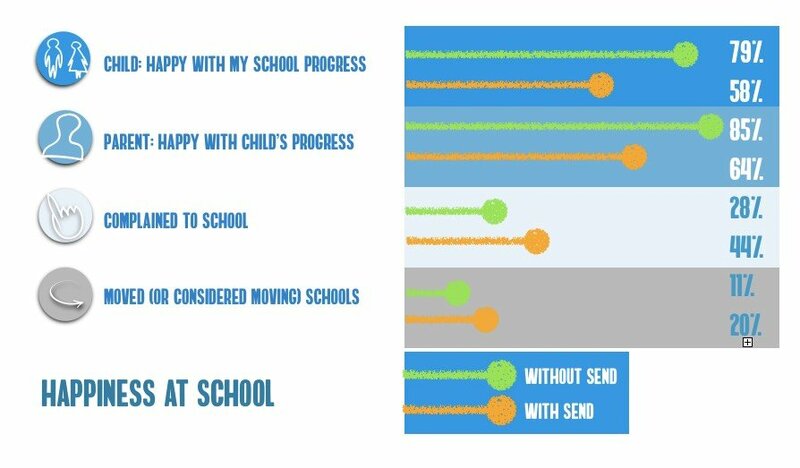 In the above infographic, you can see the clear differences between pupil happiness with their progress and parents' happiness with their child's progress when a child does or does not have SEND. Schools, it seems are generally doing well for your 'average' child. But when the child has special educational needs or a disability, both that level of satisfaction and the number who have complained to a school or even moved their child (or thought about it) are quite different. Should schools just accept this as, "Well, it's bound to happen if they've got difficulties" or should they be taking this as an indicator that the playing field is still far from level for all pupils and striving to narrow this gap. I'm sure the best are, but those that aren't need to be identified and helped to do this. Another of the researchers’ focuses is one of the DfE’s aims to ensure SEND pupils achieve the same chances in life as other pupils. However, the survey revealed that only just over half of pupils with SEND (54%) believed that teachers and other school staff were preparing them well for adult life once they leave school/college or training (either ‘very well’ or ‘quite well’). 66% of their parents felt the same way. This is quite a big gap in perception, and it’s also reflected in the difference between young people without SEND and their parents. 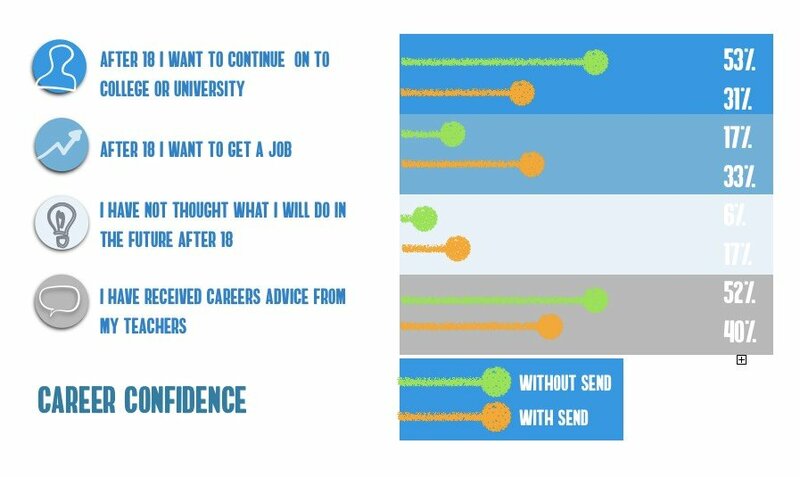 Could this perhaps reflect a generalised insecurity felt by pupils as they look ahead to the future? (Pupils without SEND: 66%) So it seems that most children in general are finding this lacking. Moving to the teacher's survey, another mass of data and again, we're focusing only on that which is SEND-related. Early identification is one of the key issues in helping children get the right help in a timely manner, so learning deficits can be improved by the correct support. In the survey, class teachers (and senior leaders) were asked about how they saw their abilities to spot special educational needs in a child or young person. 87% of respondents agreed that they feel equipped to identify pupils who are making less than expected progress and who may have a SEN or a disability. The percentage who reported that they ‘agreed’ was higher among primary schools (94 per cent) than secondary schools (81 per cent). The percentage of classroom teachers saying they ‘strongly agreed’ was lower than among senior leaders, especially in secondary schools. 73% teachers said they feel able to meet the needs of pupils on SEN Support. This broke down as 79% of senior school leaders and a lower figure of 67% of class teachers. Is this difference just class teachers lacking a bit of confidence, or senior leaders not really aware of their staff’s capabilities? Teacher training is being overhauled after the Carter Review last year and also the news last year that autism was to be a core part of Initial Teacher Training. But what of teachers who are in the classroom now, do they feel they have the training they need? 55% of all teachers believe there is appropriate training in place for all teachers in supporting SEN support pupils. 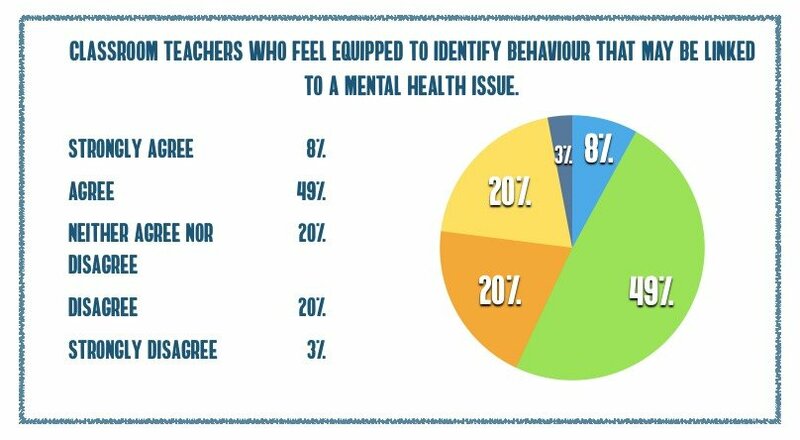 65% of these are senior teachers, only 48% of those doing the actual teaching feel this is true. 73% of all respondents reported that they ‘agree’ or ‘strongly agree’ with the statement that they were ‘confident that when support is put in place for SEN support pupils, it is based on evidence of what will work best to meet their needs, and enables them to make progress towards good outcomes’. Most of the others (16 per cent) responded ‘neither agree nor disagree’. 59% (more in secondary than primary) knew how to access school-based help. Sourcing specialist help from outside school was quite different, with 45% of classroom teachers saying they did not know how to access specialist mental health support for pupils outside of school. 32% of class teachers did, however, feel they would know where to go to get support. As I said at the beginning, the figures I have plucked out are just a snapshot from the two survey reports. Each report contains far more information than just SEND, so if you are interested, do download them yourselves. Did I miss out any key data? If you look yourself and think so, add it in the comments below. “How can they practice what they have not been shown or informed about? How much can you excuse to only being human, when parents who have ‘only’ one or two SEN children to consider, can educate themselves and research the wealth of free information out there and teachers responsible for a class of 30+ children a significant proportion of whom have SENs, cannot bother to? I had posted below another one of SNJs articles about how parental evidence on their child was deemed as irrelevant when it came to EHCPs and received the reply along the lines that this is how it was, because professional evidence/information is given more weight. Don’t you think this is where the problem lies? All the while parental expertise in their own children is disregarded in preference of professional reports which may contain errors, be based on a snapshot impression by a clinician who is a stranger and even contain misdiagnosis or missed-diagnosis. LAs will only include in EHCPs what is in reports and clinical failures result in wrongful recording of needs in EHCPs because LAs will simply not include or respect parental evidence. If this is all schools have to work from, is it any wonder? Trouble is this is a very narrow view. Autistic children often mask and this should be about their whole wellbeing and not only academic performance so this is all wrong. Does it not concern everyone that there is such a mismatch between teacher’s self-views and parent and child experience? We have two very different examples in relation to send support for our children. One accepted what they did not know. They got the training and took on board specialist advice. Our child has progressed significantly from his individual starting point. The communition is excellent. They are ambitious for my child. They have created a culture of inclusion, and personal as well as academic development of all their children. Our other example is that LA view special needs school as specialist. It is not. I cannot fault the care and love that exists. However there is insufficient funding and support to assist with the development that is needed to be able to support so many different children all with very differing needs. Feedback is lacking as is parental inclusion, the ehcp seems to have not been read by teachers and TAs and it is not understood that we assess progress to outcomes even though it is clear in the monitoring arrangements. As detailed in another comment, we do as parents access free training and information to develop ourselves to support our children, and for those of who can paid courses. There has to be the willingness to develop to to provide what children need. An understanding that the adults in school and home are the facilitators to independance. If we are not prepared to do this, then how can we have an expectation of a young person who has additional needs in relation to the majority of their peers to achieve what they need to if we are not prepared to do it ourselves.